Best lehenga shops in Chickpet Bangalore that every Bangalore bride must check out! While there are some amazing shops for bridal lehengas in Bangalore, I thought why not give you some more options to buy your bridal lehenga in Bangalore right in the shopping hub of the city? So, here are some of the best lehenga shops in Chickpet Bangalore, which you can scout through while searching for your dream lehenga. These lehenga shops in Chickpet Bangalore have some of the best bridal lehenga designs that are suited for all kinds of budgets. Scroll down and pick one or visit all of them while you’re wedding shopping in Chickpet. At Sudarshan Silks, you will find a wide range of bridal as well as fancy lehengas that you can choose to wear for your wedding day as well as other wedding functions. They also have some amazing semi-stitched lehengas for brides who wish to wear tailor-made lehengas for a better fit. Their fancy bridal lehenga price range starts from Rs. 3800 onwards. You can also check out their lehenga collection online here. 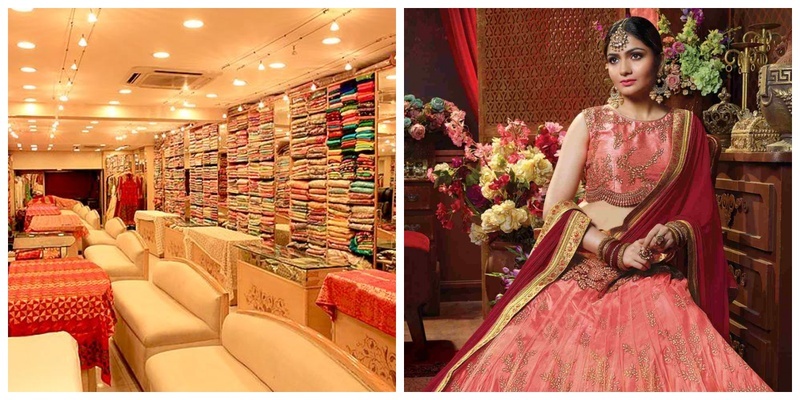 A trusted name among many Bangaloreans, Kuberan Silks is one of the best lehenga shops in Bangalore. This lehenga shop in Chickpet has a lehenga for all your needs. Be it a lehenga for sangeet or for a wedding, you will find all kinds of latest lehenga designs right here. They also stock semi-stitch bridal lehengas. Their bridal lehenga price range starts at Rs. 13,000. One of the best lehenga shops in Chickpet Bangalore, Srinidhi Silk is the place to be if you are looking for cheap bridal lehengas in Bangalore. Their heavy bridal lehenga range starts from Rs. 4400 onwards. Store Timings: Monday - Sunday 11 a.m. to 8.30 p.m. If you have decided that you want to wear Sabyasachi for your wedding, then you can find Sabyasachi lehenga in Bangalore too! We all know that the ace designer has designed the most amazing bridal lehengas, which you buy at the address below! Address: Evoluzione, No. 14, Vittal Mallya Road, Embassy classic, Ground Floor, Bengaluru. If you are looking for modern and elegant bridal lehengas in Bangalore, then Koskii is your go-to lehenga shop in Chickpet. Also, if you want to buy wedding gowns in Bangalore, Koskii has a huge range that will leave you spoilt for choice. One of the best lehenga shops in Chickpet Bangalore, Mina Bazar has a large variety of bridal lehengas in latest designs available at affordable prices too. They also have sarees, fancy suits and dress materials, which make this lehenga shop in Chickpet a one-stop destination for your wedding shopping. Kalamandir is another lehenga shop in Chickpet Bangalore that most wedding shoppers in Bangalore swear by. Kalamandir has beautiful lehenga designs in a wide range of budgets along with some gorgeous silk sarees and suits as well. You can check out their collection here. Store Timings: Monday - Sunday 10.00 a.m. to 8.30 p.m. If you are searching for designer lehenga shops in Bangalore, then you need to stop right at Meraj Lehengas. It is one of the best lehenga shops in commercial street Bangalore, where you find the most amazing lehenga designs that suit your style. Check out their entire lehenga collection here. Hope this list has helped you find the best lehenga shops in Chickpet Bangalore for your wedding shopping!